At the moment you are looking at our wonderful merchandise, Magnificat - English ed by the company Magnificat. This is a beautiful merchandise for any Christian and should be in your home. Get this item now! Magnificat promises issues that are filled with spiritual insight, exquisite art, and invaluable inspiration. You will discover the most beautiful prayers, readings, and hymns of the Church in this lavishly printed, easy-to-read, pocket-sized worship aid. Grow in prayerful love for the Savior with Magnificat magazine, a beautifully designed Catholic worship aid that helps readers fully develop their spiritual lives. Magnificat magazine helps you understand and follow Mass more closely and pray more fervently at home. Use it for your own prayers or to lead your family in worship. Each pocket-sized issue of Magnificat magazine has more than four hundred pages of content that brings you closer to the Church and its traditions. The magazine contains daily Mass texts, Scriptural meditations, and Liturgy of the Hours prayers that you'll find useful throughout the day. Magnificat magazine expands your liturgical understanding with spiritual writings about past and present saints, for example, as well as with editorials about matters of Scripture and faith. In addition, an in-depth monthly essay about a sacred art masterpiece offers insight into the cultural and spiritual legacies of the Church. Your appreciation of these magnificent works will grow with each image and accompanying theological analysis that puts the art in the context of the Church and its history. Living in prayerful reverence for the blessed Savior requires a deep commitment to the Word of God and his Church's Holy Sacraments. The prayer book guides you through that commitment with page after page of prayers for morning and night, as well as with meditations you can ponder as you go through your day. 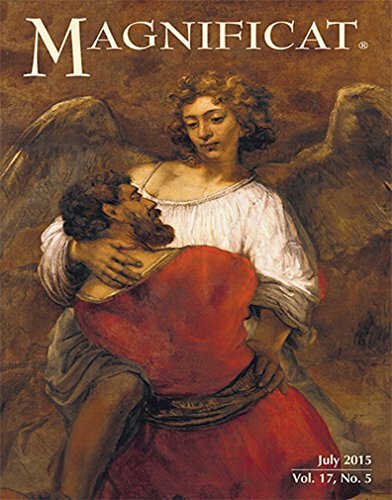 Magnificat magazine's small size makes it easy to slip it into your pocket or purse, so you can refer to it whenever you need a dose of inspiration or a more thorough understanding of daily Mass.